Become a PowerZone Volleyball Center sponsor or advertiser! Sponsorship and advertising at PowerZone gives your company's product exposure in front of over a thousand junior players, their families and adult members who have a clear understanding of the importance of sponsorships in supporting the programs at PowerZone. Our members fully understand that sponsors have provided advertising dollars to keep the gym running, to provide member discounts and affordable programs. This understanding creates an emotional connection to support our sponsors products. PowerZone sponsorship comes with a marketing plan that details objectives in providing a return on investments (ROI) to it's sponsors. Assessing the perfect partnership fit . We'll make sure that your brand is a good fit with PowerZone Volleyball. We will make sure that partnering with a us is aligned with your brand or where you want to take it. Activating member and consumer behavior. People's passions offer opportunities for engagement, sharing and value. Find the right match and unlock its power to build passion and business for your brand. Clearly defining objectives. 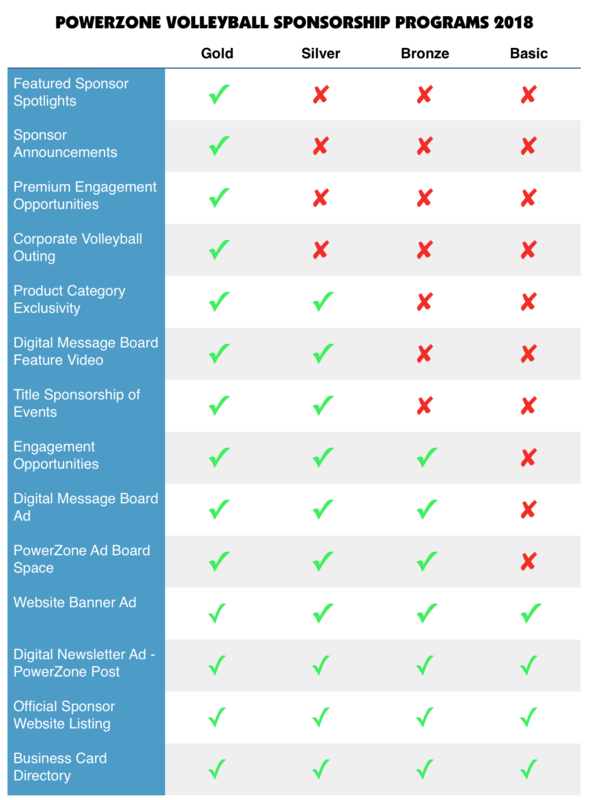 Determining sponsor goals or strategies the sponsorship can help achieve. Looking for ways to activate the sponsorship. We will utilize the sponsorship to create value and drive key behaviors. You can also utilize the sponsorship to activate your sales force, retailers, distributors, and internal departments — all of which add return to your investment. Capturing data and measure results. Clear objectives should drive opportunities for measurement and optimization, which will be the key to quantifying and improving sponsorship ROI moving forward. As an example, when our members hear the announcement, "Tonights open gym is brought to you by Wall Automotive in Rockaway Township – See Brian Wall for your automotive repairs" We are immediately reminded that Brian Wall is helps to keep our programs going and this special connection drives behavior to support our sponsors. Let PowerZone help you build your business while you help power the Zone. Sponsorship opportunities are available for local and national brands. Contact PowerZone Volleyball CEO, George Mon directly if you are interested in sponsorship or advertisement. 973-983-8208 x211 or gmon@powerzonevb.com. Featured Sponsors Spotlights & Announcements – Featured Sponsors will have exclusivity for their product(s) special feature article and announcements. Engagement Opportunities - Engagement opportunities are coordinated events that will engage our customers with your brand. Examples are sponsor presentations, showcase booths, sibling discounts, camp giveaway, etc. These are opportunities that connect your brand to our customers. Engagement opportunities are the highlight of sponsorship. Title Sponsorship of Events. Title Sponsorship allows for the event to carry a sponsor title. For example: Denville Dairy Spring Break Camp. Advertisement opportunities Advertisement opportunities for sponsors are available on our digital message boards, Advertisement boards, Website banners, Digital Newsletter, Sponsor listing, and Business Card Directory.